Edited by MV Lee Badgett & Jefferson Frank. In recent years, here in Britain, we�ve seen an almost sea-change in legal protection for lesbians and gay men. Not just Civil Partnerships but also in employment law and equality in provision of goods and services. Does this mean that discrimination against lesbians and gay men has ended? Badgett and Frank�s book shows that sexual orientation discrimination is alive and flourishing, even after all the changes in attitudes and cultures. This book is a collection of essays but the editors (Badgett and Frank) have gathered together a wide range of essays and social research that gives a wide picture of the state of sexual orientation discrimination, and it isn�t a pretty one. So often, in previous books, when they claim to be �international� they mean pieces from America and one other country (Usually Britain) only. The editors here have drawn from far more sources then that, only just American and a few of the larger European countries. Though not exactly a worldwide perspective, the editors have certainly tried to expand beyond the range of countries usually sourced. The editors� background is economics but this isn�t a book only focusing on one aspect of discrimination. 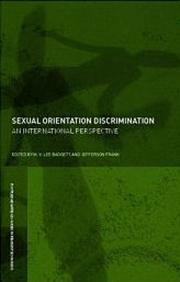 The essays look at the wide scope of sexual orientation discrimination and its causes. There are essays covering religion, education and sport, discrimination in public policies and health. Some of these essays are gems on their own. The main drawback here is that this book is a snap-shot of the situation, an analysis of the situation at one point in time. Discrimination, like progress, is not something static, waxing and waning. But the insight and information here is still valuable. This book isn�t only of interest to those studying social policy and sexuality; it�s of benefit to anyone working in healthcare, especially if you�re managing any colleagues. It is a fascinating illustration of the often unseen and even underhand sexual orientation discrimination.